My daughter took a handful of snow from the railing. "Mom, look!" She blew a puff of white fluff into the air. This process was repeated at least fifty times a day. She just couldn't get over how this light Utah snow could float, glittering like fairy dust, gently to the ground. Six to ten overnight. That's inches - and the snow was incredibly light. Light enough to billow over shoulders, fill in moguls, and create a winter wonderland of fluff. And it was only Thanksgiving! Park City's three resorts, Park City Resort, The Canyons and Deer Valley, sit within easy shuttle bus service of one another. Each has it's own distinct personality, terrain and expertise. Factor in Park City's old west ambiance, abundant off slope activities, plus array of dining and lodging options, and it rates high on the list of must see/do family destinations. When Mother Nature isn't cooperating (and that's rare in Utah), there's abundant snowmaking for early openings. 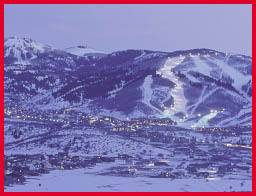 Park City Resort is usually first out of the gate - offering a variety of terrain for beginners through experts. During our visit we headed to the vertical fluff on the east side, hitting Thaynes Lift and the Jupiter Bowls. A powder paradise, we made non-stop turns down Double Jack before taking a free ride down Keystone to see the old mining buildings and another round on Jupiter. Park City's lift network comprised of four six-packs, lots of quads and various other lifts are quick - and well managed with gate-like entries that make for smooth loading. Incredibly family-friendly, Park City Resort celebrates its mining history, yet offers updated amenities and a variety of on-mountain experiences. 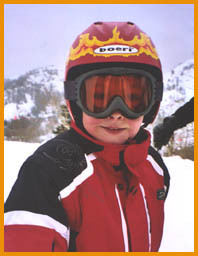 We found the Summit House to be an excellent meeting place with a variety of mountain fare suitable for kids and adults. The views rock! On day two we stumbled upon the Mid Mountain Lodge nestled on the mountainside near McConkey's and Pioneer lifts. A historic gem, the lodge was relocated and preserved to reflect the old minor's lodge that it once was. Kudos to Park City for saving a bit of the past - it makes for a unique experience. The Canyons has been quietly hammering away at enlarging, upgrading and promoting the resort. Huge in acreage, The Canyons still maintains an intimate family experience. From the short jaunt from the parking lot to the gondola via the three-minute Cabriolet, the adventure begins. 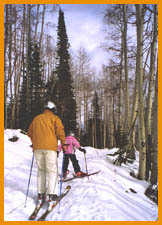 The Canyons has over 3,500 skiable acres to explore. Factor in an eight-passenger gondola and five high-speed chairs (plus numerable fixed grip chairs) and you're almost guaranteed no lift lines. The terrain is a varied as the lifts. Mellow, rolling terrain is intermixed with steep, moguled chutes. Incredibly picturesque Aspen glades create a maze of mini tree runs, with natural whoop-de-doos and banked turns. We spent our morning exploring these hidden treasures with Noah and Simon, on vacation from New Hampshire. Simon found every jump possible off of Saddleback Express. Whipping his way through the "Pines", Simon popped, dropped, and sometimes flopped - smiling the whole way. Noah's favorites were the impeccably groomed slopes like Snow Dancer and Sidewinder. Rolling, banked speed runs - the "yee-ha" variety - that got the kids going. With so much terrain to test, The Canyons will keep any family busy for a week. Factor in three resorts to choose from, and Park City's variety is pretty darn special. With free shuttle service to all resorts and many stops in town, you might consider a stay at the Grand Summit Hotel right at the base of The Canyons. They have childcare on site, easy access via the Flight of The Canyons Gondola, plus rooms and suites that include full kitchens! A visit to Park City is not complete without a stop at Deer Valley. Beware - snowboarding is still not allowed at Deer Valley. But for all you skiers out there Deer Valley's manicured terrain and upscale amenities make for a coddled experience. Deer Valley's new TNT Park (Tricks 'N' Turns) is perfect for a foray into the realm of rails, fun boxes, and jumps. Without the "snowboarder factor" the Ore Cart Rails are not intimidating and big fun. TNT also has a Skier Cross course with requisite banked turns, jumps and rolls. At $2 a run - it's a wonderful afternoon diversion for the troops. Deer Valley is all about service. Our favorite is complimentary ski storage - even overnight! Even if you can't afford a gazillion dollar home on the slopes you can play the part taking a slow, scenic tour amid the slopeside homes on the back of Little Baldy Peak. Dream big as you wind your way to the bottom of Jordanelle Express Gondola - another excursion worth taking. Put a stop at the Stein Erickson Lodge on the agenda as well. If you are killing time, brunch or lunch at the slopeside Glitretind Restaurant is worth making a reservation for. If you want the ambiance, without the expense or the big meal, grab a sandwich at the adjacent Troll Hallen Lounge where Stein is likely to stop in and say hello. Skiing and snowboarding are just the tip of the Park City iceberg. Families will find many activities, indoor and out, that make for that ultimate family vacation. Just cruising Park City's Main Street is a treat, especially in the evening when the lights come on. We headed downtown just as a light snow began to fall. Picturesque doesn't begin to describe Park City's historic streets. Home to more than 100 restaurants (in the region) there's something for everyone. As the cold wind began to filter through the down, we headed into the cozy Zoom for an epicurean delight: fine wine, delectable fare, plus kid-friendly pizza & pasta - yum. An after dinner stroll through the lightly dusted streets, a bit of souvenir shopping, plus some Swiss chocolate, the evening was complete. Sampling everything Park City has to do is not easy. If you are looking for some intriguing evening events check out the Egyptian Theatre or Mountain Town Stage - both have frequent music and theater productions. A must-do is the Heber Valley Railroad. You can ride the Polar Express (pre-holidays) or combine a day of tubing with the Tube 'n Train. Fun stuff. Another must-do is the Utah Olympic Park. It's a beautiful facility, home of the 2002 Winter Olympic venues for bobsled, luge, and ski jumping. Definitely take the tour. A van takes you to the top of the bobsled and luge tracks - wind swept, with drop-dead views, it gives you a real perspective of the speed that the tracks provide. You also get to see the top of the ski jump - and if you dare - can ride a zipline down the mountain. Big thrills! For the ultimate thrill book a bobsled ride. Kids must be over 16 and ready for the ride of their lives. At $200 bucks a pop, the ride is not cheap - but it's a once-in-a-lifetime chance to ride down the real Olympic track in a real bobsled. Call (435) 658-4206 for reservations or see utaholympicpark.com for details. Follow up your Olympic Park tour with a stop at the Alf Engen Ski Museum at the base of the park. 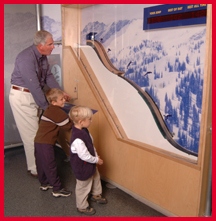 An excellent historical perspective of skiing, the museum offers interactive displays for kids as well as adults. 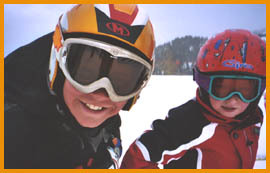 For non-skiers it offers a unique perspective of the sport including educational exhibits on equipment, snow engineering, and avalanche awareness. See engenmuseum.org for times and admission prices. The thing about Park City that is so attractive is the variety of activities available for families. On a windy day we hit the Factory Outlets - finding deals at premium outlets like Limited Too, Gap, Banana Republic and Pearl Izumi. Gorgoza Park is the ultimate tubing paradise for happy sliders. Dog sledding is gaining momentum and everybody loves a spin on Park City's outdoor rink. 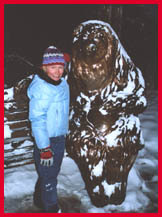 Lodging is so plentiful in Park City that it is often hard to choose. The Park City Visitor's Bureau has a good website where you can browse various lodging properties to find what best suits your needs and budget. Their Quick START program is also impressive - if you fly in to Salt Lake City, you can get a voucher for free skiing on the same day. With the airport only 30 minutes away - grab an early morning flight and get sliding by lunchtime. See parkcityinfo.com for details. Factor in the light, white fluff, the variety of activities, the dining and lodging options, plus the close proximity to the airport, and Park City gets our vote for a top spot for families. ...... Tammie Thompson lives in Truckee, CA with her husband, two adventureous children, and Lola, the Bernese Mountain Dog. Tammie can often be found making pretty turns on the slopes - or driving carloads of kids to ski races, soccer games or various other events.